There can be no doubt that the Andy Murray effect is helping Scottish Tennis clubs to attract more members and that the game is set to thrive here for many years to come. 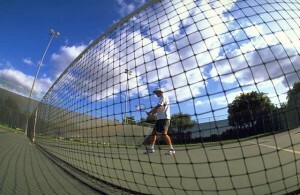 Andy’s first Grand Slam is surely set to encourage a huge number of people to take up or get more serious about the game, but with that comes a lot of pressure for many small tennis clubs to maintain their courts to the highest standards whilst still having to work within the constraints of small budgets and part time staff for the most part. weed free to ensure no adverse effect on ball rebound. To achieve these performance standards consistently a lot of work has to be carried out on the court, not only to move towards and maintain this standard, but also to keep up with wear and tear and recovery from previous play. Over seeding to improve sward composition and to compensate for wear and tear at baselines and other high wear areas. Pesticide application including weed killers, fungicides, insecticides, wetting agents and moss killers. This is just a taste of what your groundsman has to deal with, but much of this work is difficult to achieve on a small budget and without specialised equipment. Unfortunately much of the specialised equipment needed to make this work possible is used for just a small part of the year making ownership a luxury beyond the reach of many clubs. That’s where Greenmaster can help. With our fully qualified staff who all have a minimum of 10 years experience of working with fine turf and the preparation of sports surfaces we can become your secret weapon in delivering the highest quality tennis courts for your members and visitors. We can seamlessly mesh with your existing team to carry out all or some of the most important non-routine work, whether it is just one small job to help out in a particularly busy time or due to staff absence, or a longer term arrangement where we are engaged to carry out particular parts of the maintenance program. We work in a way that fits with your schedule and in a way that benefits your members and staff most. We use the most up to date equipment and techniques so that you don’t have the expense of buying, storing and maintaining specialised machinery. All of our work is guaranteed, our staff are fully compliant with health and safety requirements and we are fully insured to carry out your work.